Best Lawyers in America has selected Mr. Gooch for inclusion to its lists of administrative/regulatory law, governmental relations, and health care law every year since 2007, and named him Lawyer of the Year in 2012 for Health Care Law. CityView has also named him Top Attorney in the categories of administrative law and health care law every year since 2011. 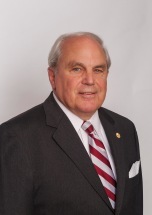 Mr. Gooch was elected Mayor of the City of Oak Ridge in 2014. Mr. Gooch has practiced law with Kramer Rayson, LLP for 39 years and served as its Managing Partner from 2007 to 2009.